A photo of a representation of the majority of the play in last night’s game. Short passing in the middle of the field, far away from the goal. I have given up hope that soccer would be a pastime I can enjoy with my children. Once again, I sat through a 0-0 draw, with few chances from either team. Last Wednesday night, Serbia hosted Ireland in a friendly match as preparation for the upcoming World Cup Qualifying play starting next month. Both Ireland and Serbia are those average small country European teams that usually don’t escape the first round of major tournaments and recently they have not performed all that great. Ireland lost three consecutive games in June’s Euro Cup and Serbia is 0-4 in their latest exhibition matches. The stadium was half full and the small contingent of Irish fans were making more noise than Serbian fans for most of the game. It was perfect however, for taking my boys. 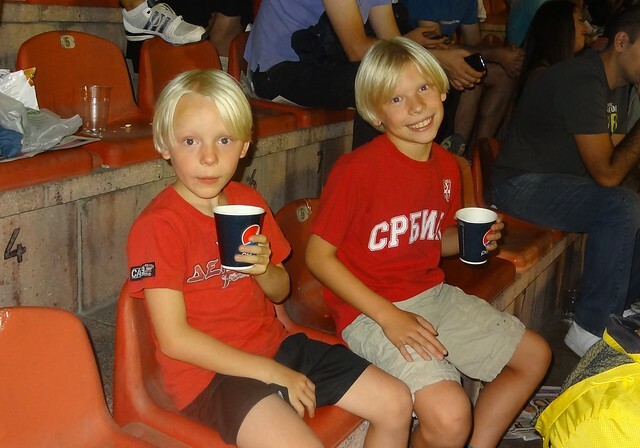 Red Star stadium has a great atmosphere but they have a long way to go to make the experience a truly enjoyable one. The seats were hard plastic and many broken, the bathrooms are an absolute disaster, and there is no replays on the scoreboard screen. I don’t know how long it will take to get wireless internet. I guess my main issue with soccer is it is too hard to score. No one on the field in the game could take the ball and manuever around a defender to take a shot at the goal. Instead it was the endless pass backwards to maintain possession and then as they try to set up a perfect shot in front of the goal, they got the ball stolen by a defender. This happened as the “attacker” play-acts and falls, desperate to get a penalty kick because it is so difficult to score in normal play. It has been 180 minutes plus of me watching this “ticky-tack” Spanish style possession play but without any real talent to drive and score. Don’t they understand that one needs to shoot the ball at the goal, regardless of the angle or distance if they want to score. The more shots that the goalkeeper has to stop, the greater the chance of scoring. At least I got to spend time with my boys and ordering hot dogs and cokes kept them occupied through the whole game. I told myself I am swearing off going to the stadium as it is a waste of my time to be bored watch guys play keep-away. Will I change my mind for the World Cup Qualifiers?